Majestic 12 (also known as Majic 12, Majestic Trust, M12, MJ 12, MJ XII or Majority 12) is the purported code name of a secret committee of scientists, military leaders, and government officials, supposedly formed in 1947 by an executive order of U.S. President Harry S. Truman. The purpose of the committee was to investigate UFO activity in the aftermath of the Roswell incident – the purported crash of an alien spaceship near Roswell, New Mexico, in July 1947. This alleged committee is an important part of the UFO conspiracy theory of an ongoing government cover up of UFO information. The primary evidence for the existence of a group named Majestic twelve is a collection of documents that first emerged in 1984 and which have been the subject of much debate. 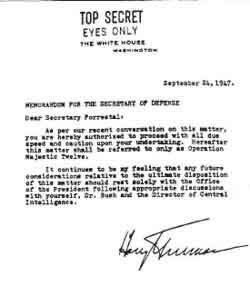 The original MJ-12 documents state that: The Majestic 12 group… was established by secret executive order of President Truman on 24 September, 1947, upon recommendation by Dr. Vannevar Bush and Secretary of Defense James Forrestal. Since the first MJ-12 documents, thousands of pages of other supposed leaked government documents mentioning MJ-12 and a government coverup of UFO reality have also appeared, sometimes collectively referred to as the “Majestic Documents.” All of them are controversial, with many disputing their authenticity. A few have been proven to be unquestionably fraudulent, usually retyped rewrites of unrelated government documents. The primary new MJ-12 document is a lengthy, linotype-set manual allegedly dating from 1954, called the MJ-12 “Special Operations Manual (SOM)”. It deals primarily with the handling of crash debris and alien bodies. Objections to its authenticity usually center on questions of style and some historical anachronisms. The MJ-12 documents are alleged to date from 1942 to 1997 and have been hotly debated in the UFO community. The documents include such matters as the conduct to be used when meeting an alien, diagrams and records of tests on UFOs, memos on assorted coverups, and descriptions of the President’s statements about UFO-related issues. The documents contain supposed signatures of important people such as Albert Einstein and Ronald Reagan, creating a major debate in the conspiracy and UFO communities. No more documents have been leaked or released since 1997. Their authenticity remains uncertain, and some claim them to be entirely fake. However, before the appearance of the various dubious MJ-12 documents, Canadian documents dating from 1950 and 1951 were uncovered in 1978. These documents mention the existence of a similar, highly classified UFO study group operating within the Pentagon’s Research & Development Board (RDB) and headed by Dr. Vannevar Bush. Although the name of the group is not given, proponents argue that these documents remain the most compelling evidence that such a group did exist. There is also some testimony (see Arguments for below) from a few government scientists involved with this project confirming its existence. Another government group recently associated with MJ-12 was the CIA’s Office of National Estimates or ONE, a forerunner of the current National Intelligence Council (NIC). ONE was created in 1950 by CIA Director Gen. Walter Bedell Smith, alleged to have replaced Secretary of Defense James Forrestal on MJ-12 after his death. A history of the NIC states that ONE was a type of super branch of the CIA “whose sole task was to produce coordinated ‘National Intelligence Estimates. '” Besides Smith, it apparently consisted of 11 other members. A recent article on the history of the CIA’s involvement in UFO investigations states that ONE received a UFO intelligence briefing on January 30, 1953, immediately after the end of the CIA’s UFO debunking study known as the Robertson Panel. At the Mutual UFO Network or MUFON 2007 Symposium in Denver Colorado, UFO researcher Brad Sparks presented a paper that describes the MJ12 documents as an elaborate disinformation campaign pepetrated by William Moore, Richard Doty, and other Air Force Office of Special Investigations (AFOSI) personnel. The sources for this information are files dating from 1981 (3 years before the first alleged MJ12 documents surfaced) that UFO researcher Bob Pratt gave MUFON before his death in 2005. The information lay hidden in MUFON’s archives until they were digitized as part of MUFON’s Pandora Project and made available to UFO researchers. The paper can be downloaded from the following reference. MUFON has made the Pratt documents available online at . Of interest will be the paragraph that has a handwritten date of 1/02/82 and states: “3. UFO project is Aquarius, classified Top Secret with access restricted to MJ 12. (MJ may be “magic”). This project begun about 1966, but apparently inherited files of earlier project.” The significance of this paragraph is that it ties MJ12 to the Aquarius document, a known fabricated document, that alleges that Jesus Christ was an alien. On the other hand, as a personal note from this contributor, the Aquarius Era (12 being the twelve months of the year, for instance) began more or less at the same time the same documents were digitized, de-classified : maybe the reference to Aquarius is solely a temporal reference to the moment in which the material was supposed to lose it’s status otherwise known as ‘Classified Top Secret with restricted to MJ 12’. This could be the “magic” refered in the comment, necessary for correct interpretation – the coeherence of this interpretation might come from the fact that Project Aquarius previous name was Project SIGN. The Pratt documents also contain the 1982 conversation between Bill Moore and Bob Pratt discussing the characters and plotline of a fictional book that Moore wanted Pratt to write. Moore is fixated on the Truman-Eisenhower transition period in UFO history and two crashed saucers, both of which figure prominently in the Eisenhower Briefing Document allegedly leaked to Moore’s friend Jaime Shandera in 1984 and which Moore claims to have no prior knowledge of. According to other sources and MJ-12 papers to emerge later, famous scientists like Robert Oppenheimer, Albert Einstein, Karl Compton, Edward Teller, John von Neumann, and Wernher von Braun were also involved with MJ-12. 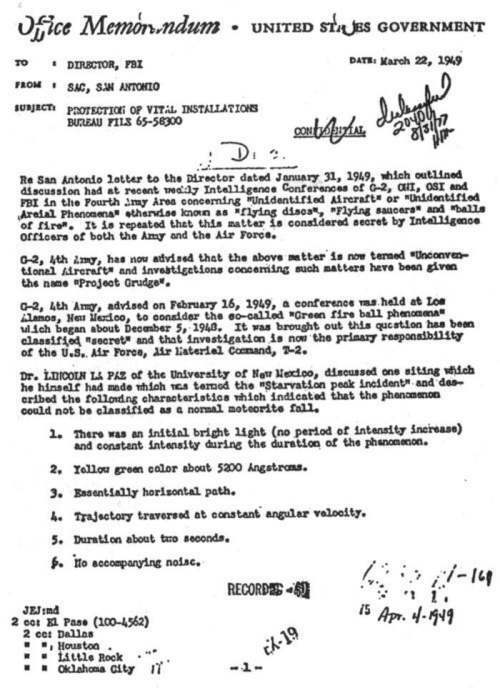 Vandenberg met with Bush’s JRDB in a suddenly-called meeting on the morning of the Roswell UFO incident (July 8, 1947) and was reported in the press as handling the later public relations crises. Radm. Konstantine Konopisos most recently implicated to involvement with later years of the MJ12 activities as Vice JAG of the US NAVY. The National Advisory Committee for Aeronautics (NACA), which Hunsaker chaired from 1941-1958, is also known from documents to have occasionally delved into UFO cases. Other members of NACA were Bush (1938-1948), Compton (1948-1949), Vandenberg (1948-1953), Twining (1953-1957), and Bronk (1948-1958). Research has also shown that there were many social and professional connections between many of the alleged members of MJ-12. For example, Bush, Hunsaker, Bronk, and Berkner all sat on the oversight committee of the Research and Development Board (RDB), which Bush had established and initially chaired. Other notables on the RDB oversight committee were Karl Compton, Robert Oppenheimer, and Dr. H. P. Robertson, who headed up the debunking Robertson Panel, of which Berkner was a member. As mentioned, 1950 Canadian documents indicated that Bush headed up a small, highly secret UFO study group within the RDB. The purported members were trusted and high ranking officials and scientists, with a history of inclusion in important government projects and councils; they possessed a diverse range of skills and knowledge while also having a high security clearance. At the same time that they possessed these qualities, however, they were not so public figures as to be instantly missed should they be called upon in an emergency one wished to keep secret. If such a group existed, these members would be the likely types of individuals to be part of its membership. The history of the MJ-12 papers is highly complex, with a series of often-confusing assertions, counterassertions and debates. In 1978 Canadian researcher Arthur Bray uncovered previously-classified Canadian UFO documents naming Dr. Vannevar Bush as heading a highly secret UFO investigation group within the U.S. Research and Development Board. No name for the group was given. Bray published excerpts of the documents in his 1979 book, The UFO Connection. The earliest citation of the term “MJ Twelve” originally surfaced in a purported U.S. Air Force teletype dated November 17, 1980. This so-called “Project Aquarius” teletype had been given to Albuquerque physicist and businessman Paul Bennewitz in November, 1980, by U.S. Air Force Office of Special Investigations counterintelligence officer Richard C. Doty as part of a disinformation campaign to discredit Bennewitz, who claimed to have uncovered evidence of extraterrestrials on earth. Bennewitz had photographed and recorded electronic data of what he believed to be UFO activity near nearby Kirtland AFB, which he had reported to officials at Kirtland. Later it was discovered the Aquarius document was phony and had been prepared by Doty. As Bennewitz was the subject of a disinformation campaign, many investigators are automatically suspicious of any documents or claims made in association with the Bennewitz affair. Because the entire MJ-12 affair made its appearance only a year after Bray had made public the incriminating Canadian documents about the secret UFO committee, one theory is that the Project Aquarius teletype was part of a counterintelligence hoax to discredit the information in the just-revealed Canadian documents. Thus the various MJ-12 documents could be fake, but the secret committee described in the verified Canadian documents could still have been real. What came to be known as the “MJ-12 papers” — detailing a secret UFO committee allegedly involving Vannevar Bush — first appeared on a roll of film in late 1984 in the mailbox of television documentary producer (and amateur ufologist) Jamie Shandera. Shandera had been collaborating with Roswell researcher William Moore since 1982. In January 1981, Doty provided Moore with a copy of the phony Aquarius document with mention of MJ Twelve. Moore would later claim in 1989 that he began collaborating with AFOSI in spying on fellow researchers such as Bennewitz, and dispensing disinformation, ostensibly to gain the trust of the military officers, but reality to learn whatever UFO truth they might have, and also to learn how the military manipulated UFO researcher. In return, Doty and others were to leak information to him. Later it would turn out that some of the UFO documents given Moore were genuine, but others were forged by Doty and compatriots, or were retyped and altered from the originals. Furthermore, the film mailed Shandera with the MJ-12 documents was postmarked “Albuquerque,” raising the obvious suspicion that the MJ-12 documents were more bogus documents arising from Doty and AFOSI in Albuquerque. Moore soon showed a copy of the Aquarius/MJ 12 teletype given him by Doty to researchers Brad Sparks and Kal Korff. In 1983, Moore also sought Sparks’ reaction to a plan to create counterfeit government UFO documents, hoping to induce former military officers to speak out. Sparks strongly urged Moore not do this. The previous year Moore had similarly approached nuclear physicist and UFO researcher Stanton T. Friedman about creating bogus Roswell documents, again with the idea of encouraging witnesses to come forward. Also, in early 1982, Moore had approached former National Enquirer reporter Bob Pratt (who had first published a story on Roswell in the Enquirer in 1980). Moore asked Pratt to collaborate on novel called MAJIK-12. As a result, Pratt always believed that the Majestic-12 papers were a hoax, either perpetrated personally by Moore or perhaps by AFOSI, with Doty using Moore as a willing target. Moore, however, flatly denied creating the documents, but eventually thought that maybe he had been set up. Noted UFO skeptic Philip J. Klass would also argue that Moore was the most likely hoaxer of the initial batch of MJ-12 documents. The film received by Shandera in 1984 consisted of two MJ-12 documents. The main document, dated November 18, 1952, was supposedly prepared by Rear Admiral Roscoe Hillenkoetter, the first CIA director, to brief incoming president Dwight Eisenhower on the committee’s progress. The document lists all the MJ-12 members and discusses United States Air Force investigations and concealment of a crashed alien spacecraft near Roswell, New Mexico, plus another crash in northern Mexico in December 1950. Eisenhower did indeed receive extensive briefings November 18, 1952, including a briefing at the Pentagon by the Joint Chiefs of Staff, which would have included alleged MJ-12 members Twining and Vandenberg. However, Eisenhower¹s Pentagon briefing is still classified and thus the subject matter discussed remains speculative. In 1985, Shandera and Moore began receiving post cards postmarked ³New Zealand² with a return address of “Box 189, Addis Ababa, Ethiopia.” The cards contained a series of cryptic messages referring to “Reeses [sic] Pieces” and “Suitland” (among other terms) that Shandera and Moore assumed were a code; however, they were unable to “decode” the seeming message. After a few days in Suitland, Shandera and Moore discovered yet another MJ-12 document, the so-called Cutler/Twining memo, dated July 14, 1954. Interestingly enough, the memo turned up in “Box 189” of the record group. In this memo, NSC Executive Secretary and Eisenhower¹s National Security Advisor Robert Cutler informed Air Force Chief of Staff (and alleged MJ-12 member) Nathan Twining of a change of plans in a scheduled MJ-12 briefing. Moore and Shandera have been accused of hoaxing the memo and then planting it in the archives. However, Friedman notes that the memo, unlike the other early MJ-12 papers which were available only as photos, is on original onionskin paper widely used by the government at that time. It also has some subtle historical and other details that a civilian hoaxer would be unlikely to know, such as a red pencil declassification marking also found with the other declassified files. Furthermore, NARA security procedures would make it difficult for a visitor to the Archives to plant such a document; even the skeptical Klass argued that NARA security procedures made it highly unlikely that Shandera and Moore could have planted the Cutler-Twining memo in the archives. Instead, Friedman has argued that one of the many Air Force personnel involved in declassifying NARA documents could easily have planted the Cutler/Twining memo in with other unrelated documents. However, most researchers have argued that various subtle details point to a forgery (though this doesn¹t negate Friedman¹s point that the memo could have been planted by someone in the Air Force). For example, the date of the alleged MJ-12 meeting does not correspond to any known meeting of import. 3. Researchers on the staff of the National Archives have searched in the records of the Secretary of Defense, the Joint Chiefs on Staff, Headquarters U.S. Air Force, and in other related files. No further information has been found on this subject. 4. Inquiries to the U.S. Air Force, the Joint Chiefs of Staff, and the National Security Council failed to produce further information. 5. The Freedom of Information Office of the National Security Council informed the National Archives that “Top Secret Restricted Information” is a marking which did not come into use at the National Security Council until the Nixon Administration. The Eisenhower Presidential Library also confirm that this particular marking was not used during the Eisenhower Administration. 7. The National Archives searched the Official Meeting Minute Files of the National Security Council and found no record of an NSC meeting on July 16, 1954. A search of all NSC Meeting Minutes for July 1954 found no mention of MJ-12 nor Majestic. 8. The Judicial, Fiscal and Social Branch searched the indices of the NSC records and found no listing for: MJ-12, Majestic, unidentified flying objects, UFO, flying saucers, or flying discs. 9. NAJA found a memo in a folder titled “Special Meeting July 16, 1956” which indicated that NSC members would be called to a civil defense exercise on July 16, 1956. The MJ-12 documents were first made public in 1987 by Shandera, Moore, and Friedman. Another copy of the same documents Shandera received in 1984 was mailed to British researcher Timothy Good in 1987, again from an anonymous source. Good first reproduced them in his best-selling book Above Top Secret (1988), but later disowned the documents as likely fraudulent. After the documents became widely known with the publication of Good¹s book, the Federal Bureau of Investigations then began its own investigation, urged on by debunker Philip J. Klass. The MJ-12 documents were supposedly classified as “Top Secret”, and the FBI’s initial concern was that someone within the U.S. government had illegally leaked highly classified information. According to Good, “In Air Force parlance, the term ‘special plans’ is a euphemism for deception as well as for ‘perception management’ plans and operations.” Conducting an interview with one Roswell witness, Weaver himself admitted, ³We¹re the people who keep the secrets.² It is difficult to tell from interviews such as these, as the cold war tactics of deceptions within deceptions are intentionally vague as to where the disinformation and coverup of espionage ends and the government’s actual investigation into UFOs begins. Soon after their disclosure, MJ-12 was absorbed into many other alleged conspiracies; Milton William Cooper’s works (especially Behold A Pale Horse) are key in this introducing MJ-12 to a wider, conspiratorially-minded audience, and have generated significant criticism as unfounded. Some of these later versions insist that the “M” in “MJ-12” stands not for “Majestic” but for “Majority”. According to less extravagant conspiracy theory lore, Majestic 12 was created with a more humble goal: to cover up alien activities on Earth, and liaise with the aliens to obtain technology in exchange for knowledge and testing on human biology. Another person to say that MJ-12 still existed was Dr. Eric Walker. When originally contacted, Walker said he had known of their existence since their creation in 1947. Similar to Novel, Walker in a later 1990 interview said the current membership was mostly American but had added some foreigners. They were a highly elite group of individuals and Walker repeatedly discouraged interviewers from trying to learn more, saying there was nothing the average person could do. Project Grudge was a short-lived project by the U.S. Air Force to investigate unidentified flying objects (UFOs). Grudge succeeded Project Sign in February, 1949, and was then followed by Project Blue Book. The project formally ended in December 1949, but actually continued on in a very minimal capacity until late 1951. Project Sign had been active from 1947 to 1949. Some of Sign’s personnel including director Robert Sneider, favored the extraterrestrial hypothesis as the best explanation for UFO reports. They prepared the Estimate of the Situation arguing their case. This theory was ultimately rejected by high-ranking officers, and Project Sign was dissolved and replaced by Project Grudge. Project Blue Book was one of a series of systematic studies of Unidentified flying objects (UFOs) conducted by the United States Air Force (U.S.A.F.). Started in 1952, it was the second revival of such a study. A termination order was given for the study in December 1969, and all activity under its auspices ceased in January 1970. Project Blue Book had two goals: to determine if UFOs were a threat to national security, and to scientifically analyze UFO-related data. Thousands of UFO reports were collected, analyzed and filed. As the result of the Condon Report, which concluded there was nothing anomalous about any UFOs, Project Blue Book was ordered shut down in December 1969. This project was the last publicly known UFO research project led by the USAF. By the time Project Blue Book ended, it had collected 12,618 UFO reports, and concluded that most of them were misidentifications of natural phenomena (clouds, stars, et cetera) or conventional aircraft. A few were considered hoaxes. 701 of the reports – about six percent – were classified as unknowns, defying detailed analysis. The UFO reports were archived and are available under the Freedom of Information Act, but names and other personal information of all witnesses have been redacted. Though many accepted Blue Book’s final conclusions that there was nothing extraordinary about UFOs, critics – then and now – have charged that Blue Book, especially in its later years, was engaging in dubious research, or even perpetuating a cover up of UFO evidence. Some evidence suggests that not only did some UFO reports bypass Blue Book entirely, but that the U.S. Air Force continued collecting and studying UFO reports after Blue Book had been discontinued, despite official claims to the contrary. The Trilateral Commission is a private organization, established to foster closer cooperation between America, Europe and Japan. It was founded in July 1973, at the initiative of David Rockefeller; who was Chairman of the Council on Foreign Relations at that time. The Trilateral Commission is widely seen as a counterpart to the Council on Foreign Relations. He pushed the idea of including Japan at the Bilderberg meetings he was attending but was rebuffed. Along with Zbigniew Brzezinski and a few other people, including individuals from the Brookings Institution, Council on Foreign Relations and the Ford Foundation, he convened initial meetings out of which grew the Trilateral organization. Other founding members included Alan Greenspan and Paul Volcker, both eventually heads of the Federal Reserve system. Its first executive committee meeting was held in Tokyo in October 1973. In May 1976, the first plenary meeting of all of the Commission’s regional groups took place in Kyoto, attended by Jimmy Carter. Today it consists of approximatively 300 350 private citizens from Europe, Pacific Asia (Asia & Oceania), and North America, and exists to promote closer political and economic cooperation between these areas, which are the primary industrial regions in the world. Its official journal from its founding is a magazine called Trialogue. Membership is divided into numbers proportionate to each of its three regional areas. These members include corporate CEOs, politicians of all major parties, distinguished academics, university presidents, labor union leaders and not-for-profits involved in overseas philanthropy. Members who gain a position in their respective country’s government must resign from the Commission. The organization has come under much scrutiny and criticism by political activists and academics working in the social and political sciences. The Commission has found its way into a number of conspiracy theories, especially when it became known that President Jimmy Carter appointed 26 former Commission members to senior positions in his Administration. Later it was revealed that Carter himself was a former Trilateral member. In the 1980 election, it was revealed that Carter and his two major opponents, John B. Anderson and George H. W. Bush, were also members, and the Commission became a campaign issue. Ronald Reagan supporters noted that he was not a Trilateral member, but after he was chosen as Republican nominee he chose Bush as his running mate; as president, he appointed a few Trilateral members to Cabinet positions and held a reception for the Commission in the White House in 1984. The John Birch Society, which takes a conspiracy-oriented view, believes that the Trilateral Commission is dedicated to a one-world government. In 1980, Holly Sklar released a book titled Trilateralism: the Trilateral Commission and Elite Planning for World Management. Since many of the members were businesspeople or bankers, actions that they took or encouraged that helped the banking industry have been noted. Jeremiah Novak, writing in the July 1977 issue of Atlantic, said that after international oil prices rose when Nixon set price controls on American domestic oil, many developing countries were required to borrow from banks to buy oil: “The Trilaterists’ emphasis on international economics is not entirely disinterested, for the oil crisis forced many developing nations, with doubtful repayment abilities, to borrow excessively. The North American continent is represented by 107 members (15 Canadian, seven Mexican and 85 U.S. citizens). The European group has reached its limit of 150 members, including citizens from Austria, Belgium, Cyprus, Czech Republic, Denmark, Estonia, Finland, France, Germany, Greece, Hungary, Ireland, Italy, the Netherlands, Norway, Poland, Portugal, Romania, Russia, Slovenia, Spain, Sweden, Turkey and the United Kingdom. At first, Asia and Oceania were represented only by Japan. However, in 2000 the Japanese group of 85 members expanded itself, becoming the Pacific Asia group, composed of 117 members: 75 Japanese, 11 South Koreans, seven Australian and New Zealand citizens, and 15 members from the ASEAN nations (Indonesia, Malaysia, Philippines, Singapore and Thailand). The Pacific Asia group also includes nine members from China, Hong Kong and Taiwan. As the story goes … allegedly former President Eisenhower commissioned a secret society known as the Jason Society under the leadership of the following; Director of Central Intelligence, Allen Welsh Dulles, Dr Zbigniew Brzezinski, President of the Trilateral Commission from 1973 until 1976, and Dr. Henry Kissenger, leader of the scientific effort, to sift through all the facts, evidence, technology, lies and deceptions andfind the truth of the Alien question. The society was made up of thirty two (32) of the most prominent men in the USA. MJ-12 allegedly operates inside the Jason Society. The top 12 members of the 32 members of the Jason Society were designated as MJ-12. MJ-12 has control of everything. They are designated by the code J-1, J-2, J-3, etc. all the way through themembers of the Jason Society. The director of Central Intelligence was appointed J-1 and is the Director of the MJ-12 group. MJ-12 use to only be responsible to the President of the United States (not true anymore). The actual cost of funding the Alien connected projects is higher than anything you could imagine. Some believe that, MJ-12 runs most of the worlds illegal drug trade to hide funding and thus keep the secret from congress and the people of the United States. It was justified in that it would identify and eliminate the weak and undesired elements of our society. A secret meeting place was constructed for the MJ-12 group in Maryland and is only accessible by air. It contains full living, recreational, and other facilities for the MJ-12 group and the Jason Society. It is code named “The Country Club”. The land for The Country Club was donated by the Rockerfeller family. Only those with Ultra Top Secret – MAJI clearances are allowed to attend. MAJI – Majority Agency for Joint Intelligence: All information, disinformation, and intelligence is gathered and evaluated by this agency. This agency is responsible for all disinformation and operates in conjunction with the CIA, NSA, DIA, and the Office of Naval Intelligence. This is a very powerful organization and all Alien projects are under its control. MAJI is responsible only to MJ-12. MAJIC is the security classification and clearance of all Alien connected material, projects, and information. MJ-1 is the classification for the director of MAJI, who is the director of the CIA and reports only to the President. Other members of MAJI are designnated MJ-2, MJ-3, etc. This is why there is some confusion about references of MJ-12, the group or MJ-12 the person. Designation for MJ-12, the group are MAJI or MAJIC Designation in official documents about MJ-12 means the person only. In 1947, PROJECT SIGN was created to acquire as much information as possible about UFO’s, their performance characteristics and their purposes. In order to preserve security, liason between Project Sign and MJ-12 was limited to two individuals within the intelligence division of the Air Material Command whose roll was to pass along certain types of information through channels. Project Sign evolved Project Grudge in December of 1948. Project Grudge had an overt civilian counterpart named PROJECT BLUE BOOK, with which we are all familiar. Only “Safe” reports were passed to Project Blue Book. MJ-12 was originally organized by General George C. Marshall in July 1947 to study the Roswell-Magdalena UFO crash recovery and debris. Admiral Hillenkoetter, director of the CIA from May 1, 1947 until September 1950, decided to activate the “Robertson Panel,” which was designed to monitor civilian UFO study groups that were appearing all over the country. He also joined NICAP in 1956 and was chosen as a member of its board of directors. It was from this position that he was able to act as the MJ-12 “Mole”, along with his team of other covert experts. They were able to steer NICAP in any direction they wanted to go. With the “Flying Saucer Program” under complete control of MJ-12 and with the physical evidence hidden away, General Marshall felt more at ease with this very bizarre situation. These men and their successors have most successfully kept most of the public fooled up to the present, including much of the western world, by setting up false experts and throwing their influence behind them to make their plan work, with considerable success until now. Within 6 months of the Roswell crash on July 2, 1947 and the finding of another crashed UFO at San Augustine Flats near Magdelena, New Mexico on July 3, 1947, a great deal of reorganization of agencies and shuffling of people took place. The main thrust behind the original “Security Lid”, and the very reason for its construction, was the analysis and attempted duplication of the technologies of the discs. The activity was headed up by the following groups. No single one of these groups knew the whole story, which is not uncommon in conspiratorial circles. Each group was to know only the parts that MJ-12 allowed them to know. MJ-12 also operates through the various civilian intelligence and investigative groups. The CIA and FBI are manipulated by MJ-12 to carry out their purposes. The NSA was created in the first place to protect the secret of the recovered flying discs, and eventually got complete control over all communication intelligence. This control allows the NSA to monitor any individual through mail, telephone, telexes, telegrams, and now through on-line computers, monitoring private andpersonal communications as they may desire. SIGMA is the project which first established communications with the Aliens and is responsible for communications. PLATO is the project responsible for Diplomatic Relations with the Aliens. This project secured a formal treaty with the aliens. DELTA is the designation for the specific arm of NRO which is especially trained and tasked with security of all MAJI projects. It’s a security team and task force from NRO especially trained to provide Alien tasked projects and LUNA security (Also has the CODE NAME: “Men In Black” [MIB]). This project is ongoing. SIGN is the second project responsible for collection of intelligence and determining whether Alien presence constitutes a treat to the U.S. National Security. SIGN absorbed the BLUE TEAM project. This was a U.S. Air Force and CIA project. REDLIGHT was the project to test fly recovered Alien craft. This project was postponed after every attempt resulted in the destruction of the craft and death of the pilots. This project was carried out at AREA 51, Groom Lake, (Dreamland) in Nevada. Project REDLIGHT was resumed in 1972. This project has been partially successful. UFO sightings of craft accompanied by Black Helicopters are Project REDLIGHT assets. This project is now ongoing at AREA 51 in Nevada. (Believed to have moved to Mexico at this time for testing). SNOWBIRD was established as a cover for Project Redlight. A “Flying Saucer” type aircraft was built using conventional technology. It was unveiled to the press and flown in public on several occasions. The purpose was to explain accidental sightings or disclosures of Redlight as having been Snowbird crafts. This was a very successful disinformation operation. This project is only activated when needed. This deception has not been used for many years. This project is currently in mothballs, until it is needed again. BLUE BOOK was a U.S. Air Force, UFO, and Alien Intelligence collection and disinformation project. This project was terminated and its collected information and duties were absorbed by project Aquarius. A classified report named “Grudge/Blue Book, Report Number 13” is the only significant information derived from the project and is unavailable to the public.